If you run a business, you know that consistent sales are vital to your company’s success. 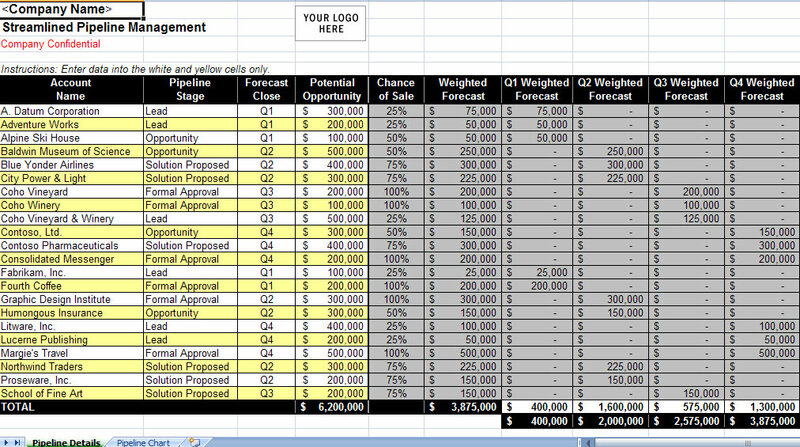 Use this Sales Pipeline Management Spreadsheet to monitor your sales funnel process. This sales pipeline management spreadsheet helps you track accounts through your entire sales process. Whether you’re following up on a new lead or closing a sale, this chart helps you visualize where you are in the process. It also provides space to enter information about the likelihood that a lead will become a sale, and the projected amount of the sale, to help you plan ahead for future quarters. Sales pipeline management is vital for controlling your sales process and making sure that every account receives the attention it deserves. This sales pipeline management spreadsheet makes tracking sales information a breeze, so you can spend more time meeting with clients and less trying to organize your sales pipeline. It also provides an option to view either details or a chart of your sales pipeline, so you can choose the format that best shows your company’s sales. We know that running a business can be tricky, so we’ve created many business spreadsheets and templates to help organize and promote your business. 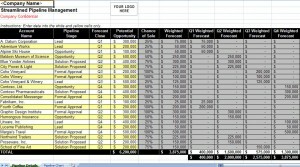 If this sales pipeline management spreadsheet has helped your business, please share it with your friends on Facebook and Twitter!